Explanation: This beautiful cosmic cloud is a popular stop on telescopic tours of the constellation Sagittarius. 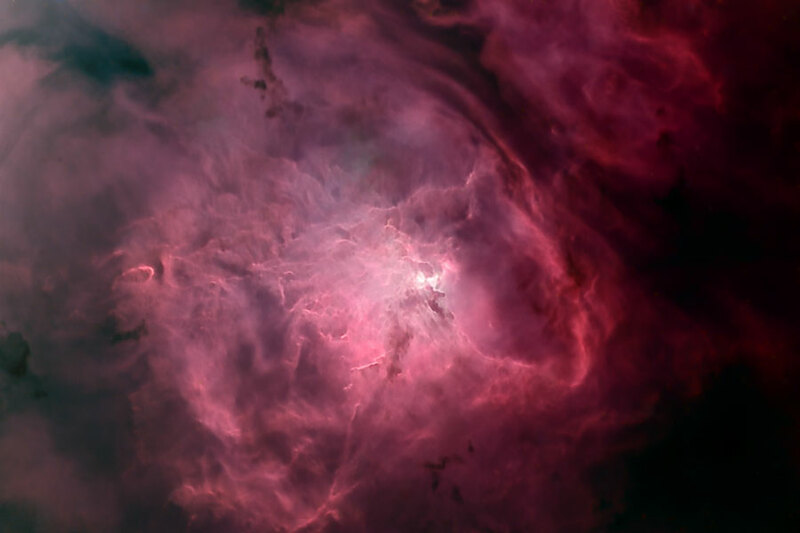 Eighteenth century cosmic tourist Charles Messier catalogued the bright nebula as M8, while modern day astronomers recognize the Lagoon Nebula as an active stellar nursery about 5,000 light-years distant, in the direction of the centre of our Milky Way Galaxy. Striking details can be traced through this remarkable picture, processed to remove stars and hence better reveal the Lagoon's range of filaments of glowing hydrogen gas, dark dust clouds, and the bright, turbulent hourglass region near the image centre. This colour composite view was recorded under dark skies near Sydney, Australia. At the Lagoon's estimated distance, the picture spans about 50 light-years.